Cowboy Kielbasa and Beans Skillet supper, throwing together this skillet meal only takes a few minutes, yet will leave your family very satisfied! I baked mine in a cast iron skillet, but any oven safe casserole dish will do just fine! Turn oven to 400 degrees. 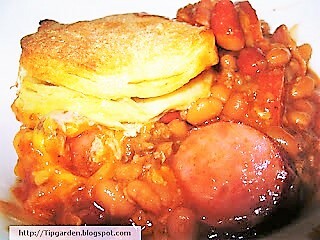 In a skillet or casserole dish mix together, beans, kielbasa, ground beef, and bbq sauce. Top with cheese and then biscuits. Jan's Tip: You may want to bake your biscuits in a separate pan, as sometimes the bottoms of the biscuits don't always cook as quick as the tops when they are sitting on top of the cheesy. Some of mine were great, and others were doughy. Bake 400 degrees 12-15 minutes till biscuits are golden brown and supper is heated through. Serve immediately.